Some people meditate. Some people pray. Some people sit on the pot and ponder. And I don't just grill in the summer. I grill all year round. Shoot, I'd grill every day if I could. Because to me, the closest thing you come to sitting around the primal fire pondering the magic of fire and charred meat is the modern day gas grill. It helps that grilling time is also a time I usually enjoy a glass of brandy as well. But it is part of the warming ritual, because I often grill on my deck at night when it is raining, snowing or just plain cold. I flip on the overhead electric heater, fire up the grill, line up the meat and sit back to reflect. Sometimes I'll tune in my starred music list from Spotify (which lately consists of some pretty haunting melodies done in a kind of fusion blue grass style). It doesn't really matter what I'm grilling. Though I prefer slow cooking meats so I have more time to reflect. I don't use timers when I grill. I think the same body clock that wakes me up every morning without an alarm clock kicks in. So I automatically know when its time to turn the meat or shift it to get a nice diamond grill mark on it. I'm not one of those purist freaks who turns their nose down at gas when they grill. I have no desire to deal with charcoal. A flame is a flame. And I'd rather have one that is pretty automatic than one I have to coax out of a brick with lighter fluid. It is the flame that my moth is drawn to, not the fuel. I usually get a bit melancholy when I grill. Not maudlin, mind you. Just pleasantly sad. Maybe it's the blue grass music. Or maybe it's brandy. Regardless, it's a time when the ghosts come out and the memories gather for a reunion. I reflect on many things when I grill. It is kind of a timeless time. No one really taught me to grill. Oh, I remember watching my father pull out the barbecue and fire up charcoal to burn burgers or cheap steaks. But he didn't relish the act the way I do. He was just cooking meat. I am getting my cosmic grill on. I am one with the smoke and the sizzling fat. I embrace the blast of heat as I lift the lid and I merge with the marinade and the steam that rises as it drips into the flame. But most of all I just sit and think as the meat evolves into a meal. My father never had that luxury. He only grilled in the summer as screaming kids ran around him throwing baseballs or splashing on the Slip and Slide. I get to sit on my deck year long and ponder as the water in the stream below our house trickles by and the cars on the adjacent street stream along. Sometimes, on a rare clear night in the Pacific Northwest, I gaze at stars while I reflect on my life and my gas grill. I reflect on the programs I see on the History Channel while I work out and marvel that, despite all of our hopes to save the planet (and mankind), it will all be for naught a few hundred million years down the line when the sun super nova's and fries everything on the planet before imploding or exploding. That will be one major grilling event I unfortunately (or fortunately) won't be around for. It puts everything into perspective. 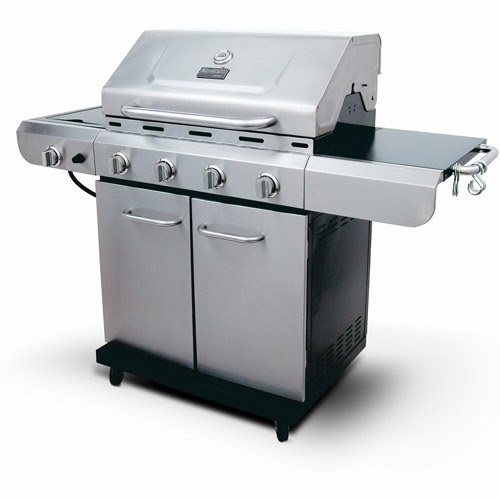 Life is like one big gas grill, and no matter how you plan things, the propane tank eventually runs out of gas (and too often when the stores are closed and you are just half way through grilling some chicken). I smell burning, in a good way. what songs are you talking about?? sounds intriguing. Cold, Cold Ground by Muddy Fork; Rattlin' Bones by Kasey Chambers & Shane Nicholson; Coal War by Joshua James; Ain't No Grave by Johnny Cash; Central and Union by Sara Watkins; Satan Your Kingdom Must Come Down by Robert Plant; I had me a girl by the Civil Wars and So Far from your Weapon by The Dead Weather. Much of it is from the series Hell on Wheels soundtrack.